Ms. Lucy's Monograms is a fabulous place to order monogrammed and personalized items for the whole family. From apparel and accessories to travel bags, doggie collars and even baby items like bibs and blankets. All of the items at Ms. Lucy's Monograms are very affordable and make fantastic gifts for someone special. Gift Wrapping service is also available. I received the Jute Tote Bag to review and absolutely love it! I had my 8 year old daughters name "Aaliyah" monogrammed on it because she has such a unique name and I can never find anything with her name on it. Plus, I knew that she would absolutely love seeing her name on such a cool bag. The bag itself is a nice large size and makes a perfect overnight bag for when she stays the night at her friends' house or for when we spend the day at the beach. I also loved the fact that it has a zipper at the top to keep everything inside and an inside pocket to keep smaller items safe. The Jute tote has leather handles, a plastic coated interior and is available is several colors (I got turquoise with lime green and bright pink thread). It measures 21" wide x 8" deep x 16" high - so it is large enough to fit clothes, blankets, toys, etc. I really liked browsing through the site and have found a few other things I definitely would like to order. The online store is easy to shop, easy to order from and is a great place to shop for gifts. There is seriously something for everyone at Ms. Lucy's Monograms. You can also choose from many colors of thread for the design, name and/or initials so you can really make something with a personal touch. And with the upcoming holiday season, I can definitely say that Ms. Lucy's Monograms is a must-stop gift shop! 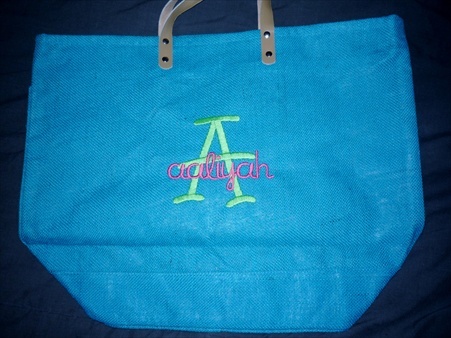 You can purchase this awesome monogrammed Jute tote bag for just $22 at http://www.mslucysmonograms.com/. One lucky reader will be randomly selected to receive their very own monogrammed Jute tote bag from Ms. Lucy's Monograms. Enter to win using the Rafflecopter form below. Complete as many entries as you want. Click the “I did it” buttons after you complete the tasks and be sure to enter you info as instructed. Please note: To keep my giveaways fair for everyone, I will verify every entry. Entries that do not follow directions will be deleted. I like the picnic cooler for him! Hello Tiffany, first time coming by your lovely blog.. I love the Christmas stockings! we have a baby boy on the way and this would be way cute! I love the large quilted cosmetic tote! I really like the Red and Black Trim Large Quilted Laptop Case!! I like the Baby Polka Dot Trim Hooded Bath Towel - Blue with White Polka Dot Trim! I like the Regular Everyday Tote; I would truly use it every day. I love the Dog Collars--esp the Christmas one! I like the Hot Pink and Lime Mini-Dots Insulated Lunch Tote. I love the 24 OZ. Acrylic Double-Wall Tumbler with Straw -LIME AND HOT PINK POLKA with INITIAL!